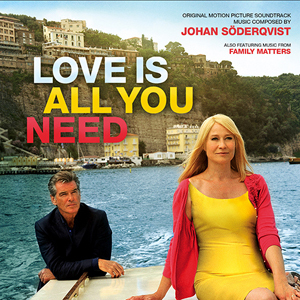 Following Sony Pictures’ theatrical release of the film in USA, MovieScore Media releases the soundtrack album for acclaimed Danish director Susanne Bier’s romantic comedy starring Pierce Brosnan and Trine Dyrholm, Love Is All You Need. The director of such intense dramas as In a Better World, Brothers and After the Wedding here showcases a lighter side of her filmmaking vision together with composer Johan Söderqvist, who contributes a light-hearted and spirited orchestral score for the film. Söderqvist is best known for his dark and mesmerizing score for "Let the Right One In" as well as his highly sensitive scores for many of Susanne Bier’s previous films. As a bonus, this album also includes music from one of the first collaborations between Bier and Söderqvist, a suite from the 1994 comedy Family Matters (“Det bli’r i familien).